Everyone loves a good jigsaw puzzle. From starting with edge pieces to moving on to the more deceptive inside pieces, they have long been an entertaining way to challenge your brain and test your deductive reasoning. That pastime now comes to Nintendo Switch in Animated Jigsaws: Beautiful Japanese Scenery, that, aside from anything, presents our first chance to piece together jigsaw puzzles anytime, anywhere, and with anyone on the portable home console. You will surely have at least gathered from the name that this Nintendo Switch release contains not only animated jigsaws, but uses moving imagery that depicts the breathtaking seasonal changes that have long made Japan such a beautiful country to explore. Whether that be the pink cherry blossom that covers trees in spring, the dramatic autumnal colours that embolden landscapes in red, brown, and orange, or the chilly weather that descends in winter, it’s no wonder that it has become such a popular tourist destination. 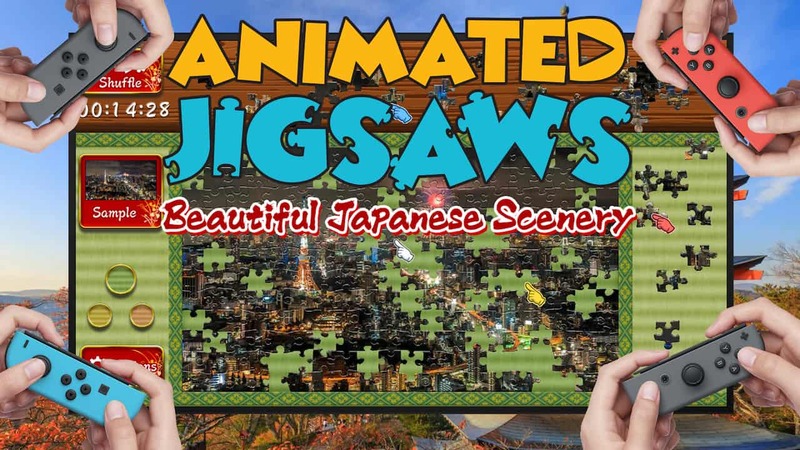 Animated Jigsaws: Beautiful Japanese Scenery leans on this to see you piecing together picturesque landscapes, attractions and historic locations. These range from Itsukushima Shrine in Hiroshima, a farm at the foot of Mount Fuji, snow monkeys keeping warm in a natural hot spring, and Shibuya Crossing, which is believed to be the busiest intersection in the world. These start out as 60-piece jigsaw puzzles before you move on to those that have 120 and 240 pieces. But, as you complete each puzzle, you will eventually unlock the chance to choose whether the picture is broken down into 60, 120, or 240 pieces. Why this isn’t an option from the start is unclear, especially when you come to the realisation that there are only 10 pictures to choose between and the developer’s expectation that you will want to complete them repeated times. It is in execution that Animated Jigsaws: Beautiful Japanese Scenery suffers more. With up to four players free to get involved, you each move a coloured pointer around the screen to pick up jigsaw pieces and, hopefully, drag them to the right location. There’s a button to hit that will quickly pile edge and inner pieces into separate groups that will soon help, but moving the actual pieces is awkwardly sluggish. This is done by simply pressing and holding the A Button over whichever piece has caught your attention, but there are times when the game randomly decides to let go of your chosen piece against your wishes. You’re not ever told about it, but you can hold down the B Button at the same time to speed up your cursor’s movement. That’s welcomed, but would have surely been better suited to the R or ZR Button and is something that you are unable to change in the settings. These problems persist in Handheld Mode too, where you can choose to use touch input but still sees the game randomly let go of the pieces that you are dragging whenever it feels like it. That’s troublesome when it is the only interaction that the whole experience relies upon. It’s not even hard to discover why the game suffers from these issues, in that BottleCube Inc., the developer, created it for Steam rather than mobile. You can still sink plenty of time into Animated Jigsaws: Beautiful Japanese Scenery. The 60-piece Kinkakuji Temple in Kyoto puzzle took me under five minutes to complete, the 120-piece Matsumoto Castle in Nagano prefecture puzzle took around 27 minutes, while I managed to complete the 240-piece Tokyo skyline puzzle in 1 hour and 30 minutes. Any jigsaws that you complete can then be viewed in the Gallery, where your best completion times are recorded. But, that last effort severely tested my patience, as, while completing the puzzles, the pictures remain animated that makes it far more difficult to match all the pieces up – a frustration that’s felt the most strongly when trying to reassemble that time-lapsed Tokyo skyline photo. It’s an oversight to not allow the player to have the choice to freeze the animation as needed, although it does add to the challenge. I even found the fast-paced Shibuya Crossing puzzle easier to complete, in comparison. Every piece doesn’t quite slot into place correctly in Animated Jigsaws: Beautiful Japanese Scenery. The whole experience feels like such an amateurish effort, whether that be seen in the unimaginative presentation, the high price point for such limited content, or the three looping music tracks that you will soon mute before they’re allowed the time to descend into monotony. Stack that with the other problems from which the game suffers, and it’s hard to recommend even as a temporary distraction.